xoxo, Jen: Holiday Link Party! 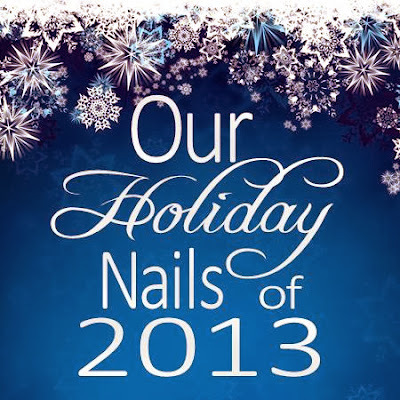 Welcome to Our Holiday Nails of 2013 blog hop hosted by Sparkle Queen! This link party has one purpose: to share our holiday manicures with each other! Everyone is welcome to share ALL of their holiday nails and manicures. You don’t have to be a blogger to enter either, as long as you can link to your holiday nails, you can enter. So if you are sharing your pictures on Nail Art Gallery, uploading to Pintrest, Instagram or Twitter, or anywhere else, you can enter too. You’ll just need the URL of where your pictures are shared. Bloggers can use THIS CODE to add the link party into their posts. *You can enter as many holiday nails as you like, but they must all go to a specific page, they can’t just go to your home page. *Link as many entries as you want. *The link party will stay open till shortly after the New Year so any new year’s inspired nails can get added too. *Nails must be holiday related one way or the other. Maybe the polish you are wearing for Christmas, or your snowy nail art scene. Any and all are welcome. *Video tutorials are OK as well, as long as you can upload an image for the thumbnail. Make sure to check out the other entries and show some love to your fellow nail ladies! yay! :) I love them! I'm so glad Sparkle Queen thought of this and shared it around! I cannot wait to see all of them! Thanks for adding! oh love your submission! Such a pretty shade of blue! Not late at all! Its open through the first of January! Glad to have ya!